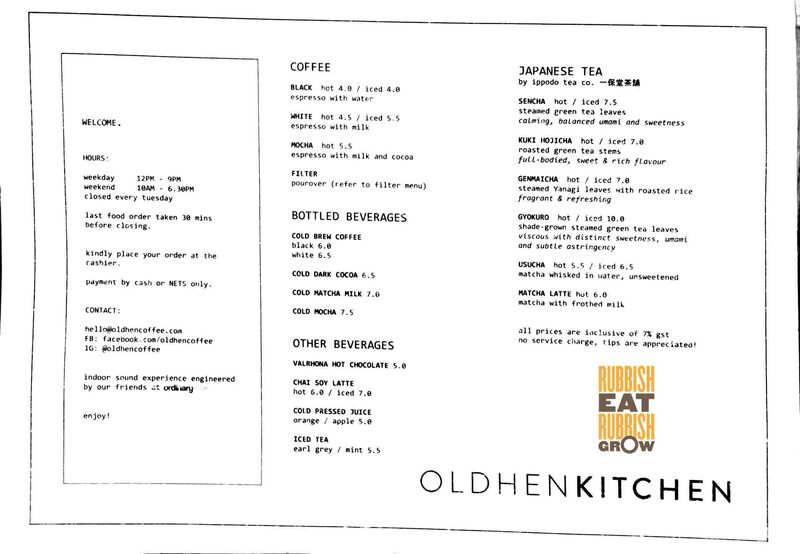 We went twice to Old Hen Kitchen at Little India, just a street away from their first cafe, the very popular and famous Old Hen Coffee at Rangoon Road. The biggest difference is that this newer offshoot serves proper mains but the first outlet serves only coffee. It is indeed overly sweet as I came to realise on my second trip. Mr Fitness had the Valrhona dark cocoa ($7.50), which is still delicious but doesn’t have the added oomph of the orange. But like the orange, it’s saccharine. We were confused about the bottled drinks. At first, we thought they were all coffee-based, since they specialise in coffee. Then while drinking, there was no taste of coffee, and eventually, we figured out that they are just chilled chocolate. I think some obvious signs are needed. As a form of comparison, we also had a hot mocha ($5.50). It is easy to drink but there is no aroma of coffee. It tastes strange in a good way, with an aftertaste of tomato? It’s a likeable and lively cuppa. On my first visit, the cafe looks lovely. It’s an open kitchen but the smell doesn’t waft to guests. Lots of wood and plants, making it look like a garden. It feels invigorating. I already had lunch that day and merely nibbled on the food of Huccalyly and Ms Atas who over-ordered. Although the chilli crab fries ($12) is expensive and although it uses generic supermarket frozen fries, it still beats truffle fries ($9). The chilli crab fries comes in a huge portion that even the three of us couldn’t finish, and the topping has chunks of crab meat. Not totally convinced if fries go with chilli crab but the chunks are visually pleasing. There are many things on the menu like avocado toast ($15), which Huccalyly ordered, and breakfast plate ($18.50) that can be easily replicated at home and they are best to be avoided. There are also pastas (about $16) and burgers (around $15). These items are rather run-of-the-mill so we avoided them. Ms Atas also ordered a ahi tuna salad ($14), which comes in a medium-sized bowl. I think salads should always come in a big bowl with lots of greens. She also had a pork belly rice bowl ($19), the most interesting thing on the menu. I took a bite and it is not bad. Good, sweet, balanced flavours, nothing too overpowering. It’s tender and not gamy. I liked the first visit so much that I brought Mr Fitness for the second visit, but it seemed like we had exhausted the menu. Their signature, beer-batted fish & chips ($18), uses halibut and has too thick a batter. It is quite ordinary. And we switched the fries to truffle fries (additional $2) but it doesn’t taste much of it. The other signature, salmon and soba ($19), is not bad. The strip of salmon, a little small, is sous vide first and then pan-fried to give the skin a crisp; nicely tender and no fishy stench. Mr Fitness didn’t like sweet mains, so the soba doesn’t work for him. It’s tossed in a sweet citrus teriyaki sauce with snow pea, edamame, carrot, red chilli and peanut. The crunch of the vegetables with the soba is quite enjoyable. 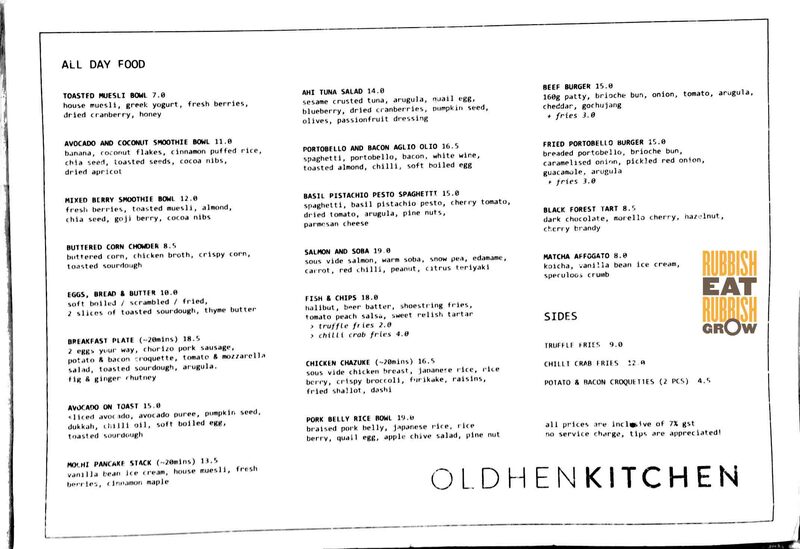 Overall, I think Old Hen Kitchen is a rather good cafe. The food is up to par and the ambience is lovely. But when you eliminate the simple dishes that only rich people who don’t grocery-shop and don’t cook would order, the limited menu means that we don’t really need to return to Old Hen to try the rest of the dishes. We paid $52 for two of us.